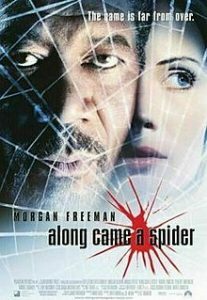 Along Came a Spider is a 2001 American neo-noir psychological thriller film directed by Lee Tamahori. The screenplay by Marc Moss was adapted from the 1993 novel of the same title by James Patterson, but many of the key plot elements of the book were controversially eliminated. The movie received negative to mixed critical reviews, although it became a box office success. It stars Morgan Freeman as Detective Alex Cross, Monica Potter, Michael Wincott, Penelope Ann Miller, and Michael Moriarty. Along Came A Spider is the first in the Alex Cross mystery series, but these book suggestions have nothing to do with Cross and his career - instead, the plots are similar to Along Came A Spider and will keep you on the very edge of your seat. A girl vanishes "on a sunny, late-summer vacation morning" and thus begins a "family's harrowing journey down increasingly divergent and solitary paths until all that continues to bind them to each other are the questions they can never bring themselves to ask: At what point does a family stop searching? At what point does a girl stop fighting for her life? In an affluent neighborhood of Minneapolis, a baby is abducted from her home after her teenage babysitter is violently assaulted. As family liaison officer with the Minneapolis P.D., Afton Tangler deals with the emotional aftermath of terrible crimes, but she's never faced a case quite as brutal as this. The only lead is a collection of seemingly unrelated clues. Afton begins to suspect that whoever did this has taken babies before - and if this case isn't solved soon, more children are sure to go missing. Gabriela McKenzie's daughter has been kidnapped. In exchange for her safe return, her abductors demand two things: $400,000 in cash, and a document known only as the October List. Frank Marr knows crime in Washington, DC. A decorated former police detective, he retired early and now ekes a living as a private eye for a defense attorney. Frank Marr may be the best investigator the city has ever known, but the city doesn't know his dirty secret. A long-functioning drug addict, Frank has devoted his considerable skills to hiding his usage from others. But after accidentally discovering a kidnapped teenage girl in the home of an Adams Morgan drug gang, Frank becomes a hero and is thrust into the spotlight. He reluctantly agrees to investigate the disappearance of another girl - possibly connected to the first - and the heightened scrutiny may bring his own secrets to light, too. Kat Kinkaid's only son goes missing on a class field trip, while Stefanie Huntington's son is being threatened. But is the culprit an anonymous stranger or someone the women trust? Thirty years ago two sisters disappeared from a shopping mall. Their bodies were never found and those familiar with the case have always been tortured by these questions: How do you kidnap two girls? Who - or what - could have lured the two sisters away from a busy mall on a Saturday afternoon without leaving behind a single clue or witness? View more suggestions for Along Came A Spider.